T. Rex were a British rock band, formed in 1967 by singer-songwriter and guitarist Marc Bolan. The band formed as Tyrannosaurus Rex, releasing four underground folk albums under the name. Tony Visconti (their producer for several albums) claimed in a documentary on the band that he had taken to using the abbreviated term "T. Rex" as a shorthand, something that initially irritated Bolan, who gradually came around to the idea and officially shortened the band's name to "T. Rex" at roughly the same time they started having big hits (shortly after going electric). In the early to mid 1970s, the band reached huge success with fourteen top-20 UK glam rock hits: "Jeepster", "Get It On", "Ride a White Swan", "Solid Gold Easy Action", "Children of the Revolution", "Hot Love", "Telegram Sam", "20th Century Boy", "Debora", "Teenage Dream", "The Groover", "New York City", "I Love To Boogie" and "Metal Guru". 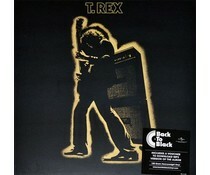 During this period the band also released six UK top-30 albums, including Electric Warrior, which hit the top of the album charts. In 1977, Bolan was killed in a car accident, and the band broke up.